Description: Since his stunning debut in 1974 with the now world-famous audiophile recordings for the Three Blind Mice label, Japanese pianist Tsuyoshi Yamamoto has built a career that now spans four decades. 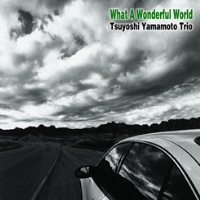 His brand-new trio album What A Wonderful World follows his previous release Gentle Blues (VHCD-1118), his first recording for Venus Records in 14 years. In fact, the 12 tracks in this CD were recorded on the day after 10 tracks on Gentle Blues were recorded. It is remarkable that Yamamoto and his trio recorded enough materials for two CDs in two consecutive days, but then again, he is a veteran pianist who doesn't like to repeat himself and prefers to record everything in a single take. This CD even contains several tunes that were included in the previous one, but they are justified as they are significantly different in terms of musical approach and presentation. The last three tracks are bonus tracks in which Yamamoto plays Fender Rhodes. As per the high standard set by Venus, the sound quality of this CD is also excellent with its signature heavy, gutsy sound. Recommended! Produced by Tetsuo Hara. Recorded at Sony Music Studios in Tokyo on January 24, 2013. Engineered by Takashi Sasaki. Mixed and mastered by Tetsuo Hara.